We now have a more affordable LCJ ultrasonic anemometer installed as part of our test Enviromonitor trial site. This is a drop-in replacement for the standard Davis 6410 anemometer and is wired to a 6820OV VP2 GroWeather ISS which is feeding data to an Enviromonitor gateway. A close-up of the installation is shown left, while the a section of the main site can be seen further below. The LCJ anemometer is the cylindrical white unit sitting on top of its own mounting pole extension. This particular LCJ model (there are several variants with distinct features) is self-powered. The power requirement is fairly small and is met by means of a small solar panel sitting on top of the unit along with a rechargeable lithium battery in the wider part of the stem of unit, immediately below the ultrasonic platform. We are assured that this combination should reliably power the unit but of course proving this part of the specification is part of the reason for the extended test (and next winter will be the key test of course – the next 5-6 months of longer, sunnier days ought to be fine). Live data from the ultrasonic anemometer is shown in the graphic below (5-minute updates). 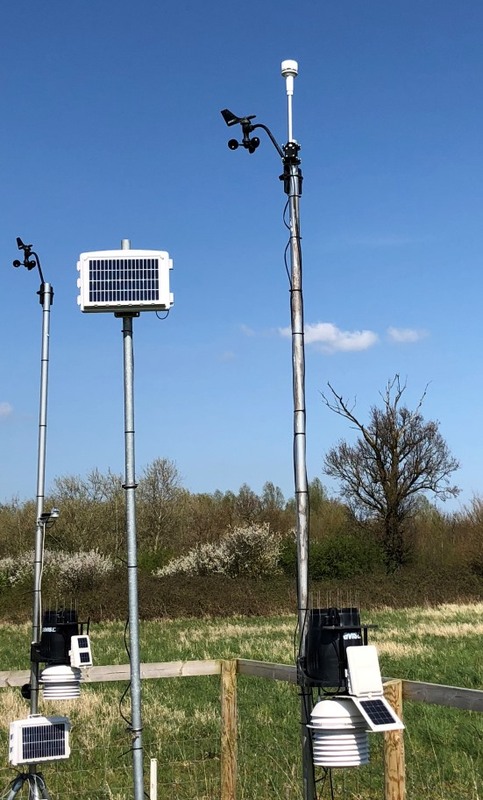 The existing 6410 anemometer has been left in situ and will shortly be connected to an EM node in the same installation. 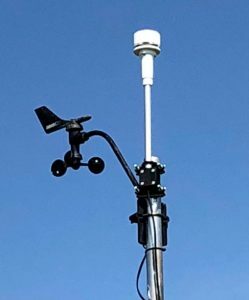 The ability to run multiple anemometers on an single EM installation is a feature that has been added with the release of the latest node firmware. Once we have data flowing reliably from both anemometers for a few days then we will aim to chart the two sets of readings and add them to this blog post.